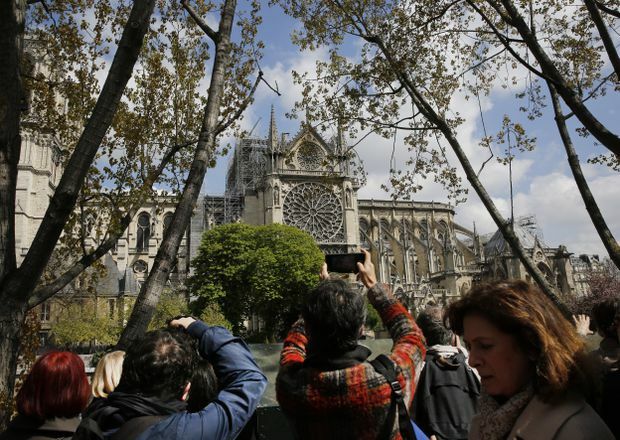 Tourists and others photograph the damage to the Notre-Dame cathedral in Paris on April 17, 2019. Fuelled by a lattice of centuries-old timbers, the fire moved hungrily across Notre Dame’s rooftop toward the cathedral’s iconic spire. It belched yellow smoke, spitting out gritty particles of wood, stone, lead and iron and wanted more. Far below, their vision obscured by fumes and tears, firefighters, priests and municipal workers passed treasures hand-to-hand, hoping the speed of desperation could outrun the flames. The first fire trucks lumbered through rush-hour traffic, blasting their two-tone sirens at full volume to reach the island that is the historic and geographic heart of Paris. For that first half-hour, it looked like the fire couldn’t possibly leave more than a small age mark on the nearly 900-year-old building – more akin to the inevitable wear on stone’s rough edges than the fury of the French Revolution that left it in ruins for decades. The spire was lost. Could Notre Dame itself be saved? From inside and out, firefighters fought the battle of their lives – a battle for the ages.